Wooden gates by Automation Gates, Our standards of manufature and options for painting. 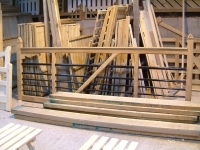 All of our wooden gates are bespoke and hand made to the customers order. We make gates to fit your entryway not adjust your entryway to fit a standard design of gate. As each of our gates are custom made all the designs shown in the pages following are ideas and we can vary them to suit the aesthetic you desire, adding or removing ornamentation, cross rails, or adding you house name into the gate design. If you prefer we can make a complete custom design to your drawing as long as the design would be structurally sound. Over ten years of experience and design refinements has lead to a construction method of hardwood and softwood gates that we are very proud of. We have taken great pains to eliminate water traps in our designs and we only use high quality timber, the framework being of external 3" thickness. This leads to an very strong and durable gate that is perfectly suited for automation. We are able to supply our gates untreated or finished with a stain or paint of the customers choice. We are happy to provide samples of wood to test with your favourite stain or samples of finished wood so you can be happy that you will get the colour you envision. Please note our pictures are examples only and each installation will vary. In particular many of these installations were undertaken before the introduction of the European standard covering automatic gates (EN12453). Since we have adapted our installation standard to comply with EN12453 hinge styles have changed and often pressure sensitive safety ribs and fixed guards are needed. If and where these safety devices will be needed is dependent on individual installation and we can advise you of what will be needed for your particular situation. We are happy to discuss with you the visual impact of any safety devices needed.